The Mr. Heater 125,000 BTU Forced Air Kerosene Heater. Safe, easy warmth for when the temperature drops. Convert your garage, barn, or tool shed into a year-round workspace! 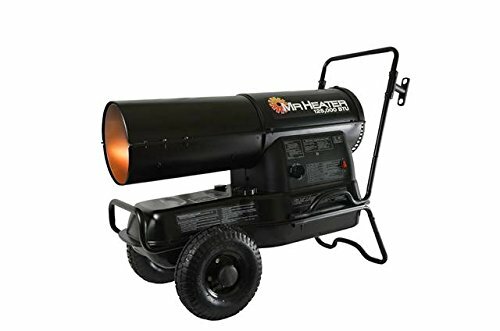 This Mr. Heater Forced Air Kerosene Heater delivers up to 125,000 BTUs of chill-chasing warmth when you're working on your truck, farm equipment, ATV and more. Heats approximately 3,125 sq. ft.. Runs up to 9 hours on a full tank. 8.5-gallon fuel tank. Easy-off access panel and side lift handles. Troubleshooting diagnostics with LED indicator. Overheat safety shut-off. Continuous ignition. Thermostat. CSA Certified.